You about? Please reply to the big old convo with your availability/confirm or not etc. 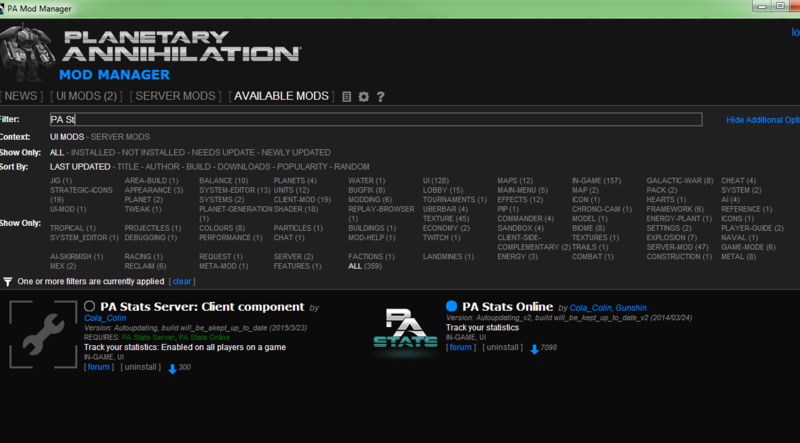 Is there a way for me to get the statistics from you PA stats mod into my own personal database? That is exclusively my games, not of other players. do you know if jabberToken changes for the uber XMPP? potentially yes? Not quite sure. possible, write about it in the thread of the mod. Have you pulled your mods from PAMM? Can't seem to locate PA Stats Online, Reconnect Button, Faster Browser(?) etc. The others are not from me, but my guess is your pamm is broken. totalannihilation and proeleert like this. Hey I was wondering if you could go into more detail on how to increase the max number of players. I read that new_game.js needs to be edited. I tried to do so with no luck. Also browsing around I have not found a topic that helps with this, but if it's here I can't seem to find it. Thanks for any help what so ever. Ok, I got the Lobby to allow 20 players, however whenever I add more than 11 bots the game does not start, it just hangs at the loading screen. I noticed there aren't enough colors to apply to every player, could this be a issue? Thanks. Probably yes, read a little into the thread I linked, it has solutions to that. 1) One of us have changed his displayed name. In the game id 156699, the player Gas is correctly displayed in teams whereas he's displayed "madgas" in winners list. Thanks for the feedback!. That is indeed a known bug. The player name listed as winner is kept as the name the player had that the moment he won. The game 176069 is another bug, which is less understood, but also already known. If a game shows a wrong winner and is rated wrong on the ladder I fix that by hand. For vs AI games it doesnt matter I hope. I also using your website to fill a spreadsheet on google docs with some stats and a specific ranking between us. I've started to write a small perl script that do the same job for me. We are a bunch of friends playing regulary PA together. Your mod "pastat" is VERY usefull for us so we can comment of each game. So first of all, a big thank you for your amazing work ! Wait what is that the secret thread? How'd you get in there? Quick question. I have been making a support ticket and no one has answear it yeat for over ~10 days. How long do you think it takes for your support to answear? A few more days for your ticket I guess. They've been swamped hard in support tickets due to a technical issue that created massive amounts of duplicate tickets. hello again i have read that and i have still no response from my tickets or emails i think 48 hours is more than enough time to wait? For the long wait time I am sorry, but I can't help you. I am not an employee of Uber, so I have no insight into the support process. Hello, i contact you here because messaging was removed on github (wtf). I'm a full stack web apps developer and i am willing to help out on improving PAStats on my spare time. I also have some decent experience with handling huge amount of data, ranking, matchmaking and other esport related stuff, having worked a couple of years as the technical lead for a french concurrent of VirginGaming. Where could we talk ?